Damarien, or Eddie as his new family calls him, was born addicted to drugs and alcohol. Sadly, this created some severe health problems for him from the very beginning. He was born with a cleft palate, a hole in his heart, deafness, as well as having Downs Syndrome. His birth mom was unable to care for him, so he was in a Foster Care home. His new family got a call on March 8, 2011. He was at Doernbecher Children’s Hospital because he only weighed 6 lbs., 9 oz. as a 3-month-old! At this point he came to live with his 3rd foster family... his forever family. They knew it was going to be a challenge to raise him and take care of all his medical needs, but they were ready and willing. He had a feeding tube and was on oxygen. He was failing to thrive. He didn’t smile or show any signs of happiness or contentment. He spent 5 months in ICU and was on oxygen until he was a year old. His new family taught him sign language and when he was 15 months old, Eddie signed to his mom for the first time… and hasn’t stopped since. Sign language is his primary source of communication. He’s had numerous surgeries since birth. Doctors removed his G-Tube when he was 5 years old. He has poor social skills because of his lack of understanding and developmental delays. It’s hard for him to concentrate and he has no social boundaries or basic idea of other people’s personal space. He’s adventurous and fearless which isn’t always a good combination for him. The family home has alarms on all the doors, as he likes to try and get out and go exploring. He has no concept of danger, so his safety is always a major concern. 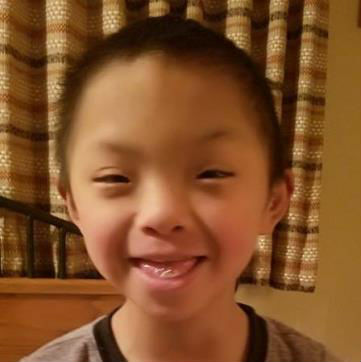 In spite of so many challenges from the very beginning, Eddie is a happy little boy who brings joy to his family and friends… even though he keeps them on their toes. He loves music, dancing, animals – especially the family pets, and playing outdoors. Sparrow Cash raised for Eddie will help with ongoing medical expenses, fencing around the family’s home, and everyday living expenses. Students at Madras High School will “earn” Sparrow Cash by completing a minimum of 256 hours of sponsored community service.